A member of the boyar family of the Tsamblaks, Euthymius (Evtimiy) was born about 1325 in Tаrnovo. He received his education at the monastery schools in the vicinity of Tаrnovo. In 1350, he became a monk and entered the Kilifarevo Monastery that was founded by Patriarch Theodosius of Turnovo. After Theodosius appointed him his assistant, they traveled in 1363 to Constantinople and spent some time at the Studion Monastery, known for its center of learning and rich library. There, Euthymius became well-known among the educated clergy of the area as he was influenced by many outstanding thinkers, scholars, and reformers of the spiritual life and beliefs in southeastern Europe. However, soon after their arrival Theodosius died. Euthymius then joined the Great Lavra of Athanasius the Anchorite on Mount Athos. In 1365, Euthymius went to Aton in what is now Greece, then a center for the Orthodox Church, where earlier that century many scholars and thinkers had lived, among them Gregory the Sinaite, Gregory Palamas, and John Koukouzelis. It was later, after he had moved to Zographou Monastery, that Euthymius began to reflect on the spelling reforms and planned corrections to the translations of the sacred books. At one point Emperor John V Palaiologos exiled Euthymius to the island of Lemnos, for unknown reasons, perhaps because he spoke against the emperor for submitting to the Pope of Rome. 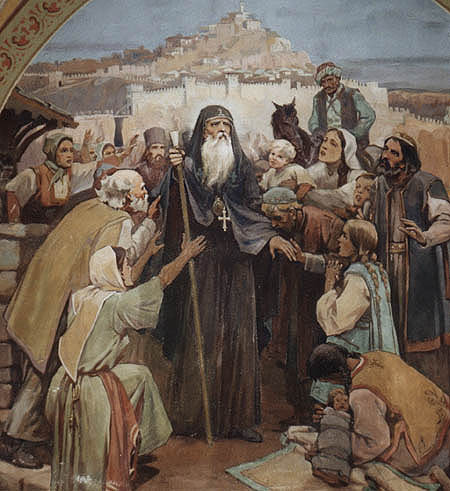 He then returned to Mount Athos for a short time at Zographou. In 1371, Euthymius returned to Bulgaria and founded a monastery near Tarnovo dedicated to the Holy Trinity that became the center of the famous Tarnovo Literary School. 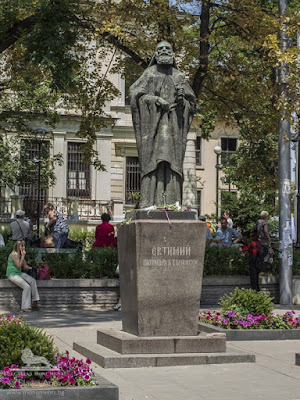 Here, he established his legacy leading the reform in the Old Bulgarian language, He established orthographic rules and corrected inaccurately translated religious books by comparing them to the Greek originals. These corrected texts became models for the Orthodox Churches using the Church Slavonic language: Bulgaria, Serbia, Romania, and Ukraine. 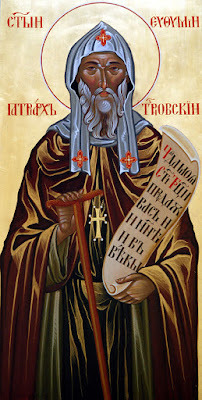 He discarded old translations of the sacred books, full of mistakes, and supplied the peoples of the Orthodox faith with new translations, in Old Bulgarian, that destroyed all reasons for disputes among Christians and their heresies. Gregory Tsamblak, his biographer, compared Euthymius' work to that of Moses and the Egyptian king Ptolemy I. In 1375, Patriarch Joanicius (Ioanikiy) died and Euthymius was elected Patriarch of Bulgaria, with his see in Tarnovo. A supporter of hesychasm, Euthymius aimed to persecute heresies and moral decay. Euthymius became a prominent figure in the Orthodox world and a number of metropolitans and hegumens addressed him to interpret theological matters. In the spring of 1393 the son of Ottoman Sultan Bayezid I, Suleyman Çelebi, laid siege to the Bulgarian capital Tarnovo with his sizable forces. With Tsar Ivan Shishman out of the city (leading the remnants of his troops to the fortress of Nikopol), Euthymius was the one entrusted with the defense of Tarnovo. After a three-month siege on 17 July 1393, the Ottomans captured the capital despite its ferocious resistance; Gregory Tsamblak several years later suggested the conquest was due to treason from one of the non-Christian neighborhoods of Tarnovo. Joasaph of Bdin, Metropolitan of Vidin, a contemporary of the event, described it as follows: "A great Muslim invasion happened and total destruction was done with this city and its surroundings." According to Gregory Tsamblak, churches were turned into mosques, priests were expelled and substituted with "teachers of shamelessness." 110 noted citizens of Tarnovo and boyars were massacred, but Patriarch Euthymius was reprieved and sent into exile in the theme of Macedonia (contemporary Thrace), possibly in the Bachkovo Monastery. He is supposed to have died there sometime between 1402 and 1404. Unfortunately we do not know where he was buried. The Tarnovo Patriarchate thereupon ceased to exist as the Bulgarian Church lost its independence and became subordinate to the Patriarchate of Constantinople until 1870. There are 15 known works by Euthymius, including liturgical books, laudatory works, passionals and epistles. Among his literary disciples are Gregory Tsamblak, Metropolitan of Kiev; Cyprian, Metropolitan of Moscow; Joasaph of Bdin and Constantine of Kostenets. St. Evtimiy Crag on Livingston Island in the South Shetland Islands, Antarctica is named after Patriarch Euthymius of Bulgaria.